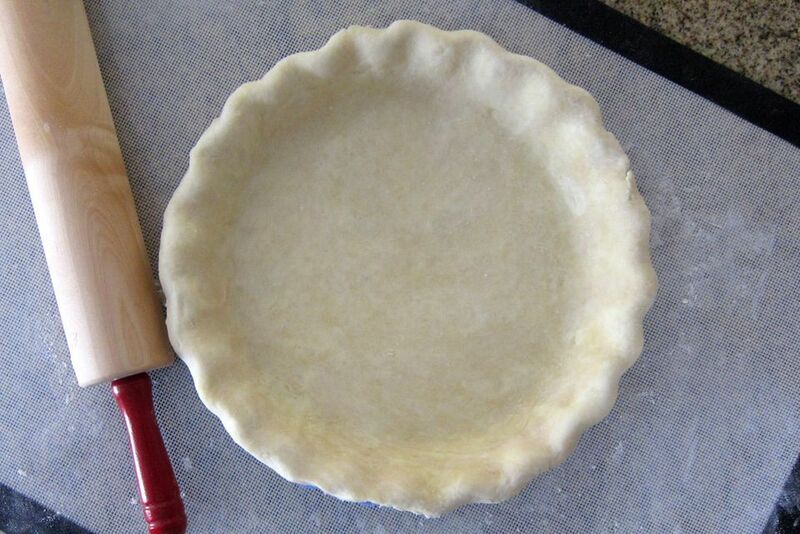 Pies are wonderful desserts because they're easy to make (especially if you use a prepared pie crust!) and loved by all. From the classics—including apple, blueberry, and lemon meringue—to the unexpected (toffee banana caramel pie, anyone? ), these easy-to-follow recipes are known for being absolute crowd-pleasers. So bake up a pie, cut yourself a slice, and dig into the goodness of the all-American dessert. A good pie with a buttery basic crust. Master this recipe and you'll be in great shape for baking up every pie on this list. Not that you have to use a homeone one all the time, but it's a great technique to have in your back pocket, especially come Thanksgiving when you're looking to impress family and friends with your pie-baking skills. Do you love eating pie, but don't feel that confident as a baker? This easy apple cranberry recipe comes with suggested shortcuts so it's a great starting point for beginning bakers. You'll love its tart-sweet flavor, too! It's a classic for a reason! This traditional recipe for an old-fashioned double-crust apple pie is as delicious as it is beautiful and always welcome at the dinner table, especially in the fall. This fabulous summer pie is made with a filling of fresh fruit, lemon juice, and a touch of nutmeg. The recipe includes a from-scratch butter crust, but feel free to use a store-bought one, too. Go bananas for this scrumptious cream pie. It's packed with plenty of fruit and toasty coconut, then topped with whipped cream or whipped topping as a beautiful finishing touch. This classic two-crust blackberry pie is a tried-and-true Southern favorite. Fresh berries and a few other pantry ingredients come together to form a sweet-tart filling that sings of summer. Squash isn't just for fall. This creative recipe is a custard-like dessert pie made with cooked summer squash, eggs, and butter. It's proof that unexpected combinations can yield delicious results. Buttermilk pie is an easy-to-prepare custard that get a delightful tang from its namesake ingredient. This is an excellent recipe to keep on hand when you need to whip up a tasty dessert with cooking basics—most of the ingredients are probably in your fridge and pantry already! Here's a fresh blueberry pie that makes a great dessert for any occasion. Fresh berries are great to use when they're in season, but frozen one will work just fine when you want a taste of summer in the cooler months. The sour cream custard filling and crumb topping make this pie extra special. Do your little ones love peanut butter? This decadent dairy-free and egg-free dessert makes a great birthday dessert for kids. Be sure you have at least one day ahead of serving to prepare this pie as it takes time to chill. No homemade pumpkin pie would be complete without a good dose of warming fall spices. This recipe combines ground ginger, cinnamon, and a pinch of nutmeg to elevate pumpkin's naturally sweet flavor. Serve topped with a dollop of whipped cream and even an extra sprinkle of cinnamon if you'd like. Cherry cheesecake pie is an all-American classic and this recipe delivers in flavor. It's made with a graham cracker crust and layers of rich cheesecake and tart cherry filling. Blueberry pie is an all-American favorite that's perfect for July 4th parties and summer cookouts. This juicy, cinnamon-spiced version is sure to be welcomed by your family and guests. Featuring brown sugar and cinnamon, this velvety butternut squash pie is sure to get nods of approval. Try it in place of pumpkin or sweet potato pie at your next Thanksgiving dinner or winter potluck. Who could resist this utterly decadent caramel pie? A sweetened meringue is the perfect finishing touch for the luscious, gooey dessert. This popular apple crumb pie is easy to prep and bake. You can create the filling and pastry from scratch or swap in store-bought ingredients when you're in a rush. It's finished with a simple butter and brown sugar crumb topping that takes this pie to a whole other level. Silken tofu is used to create a creamy custard that's completely vegan. Infused with tart key lime juice, it fills a crunchy graham cracker crust with no baking required. Chess pie originated in the South as a way to turn simple ingredients into a delectable dessert. This version combines buttermilk, eggs, cornmeal, and lemon into a tangy filling that'll earn rave reviews. Cherry pie filling and an easy cake-like crust make this easy dessert perfect for a busy weeknight or when you get a last-minute party invite. Top it off with whipped cream or, to truly impress company, serve the slices warm with a scoop of ice cream. This velvety smooth chocolate mousse recipe uses just six ingredients, making it a good first pie for novice bakers and chocolate lovers alike. There's actually no baking required! Coconut filling is cooked on top of the stove, then poured into a pre-baked crust and chilled with a whipped cream topping to create this nutty tropical pie that'll leave you dreaming of an island vacation. Baker's chocolate and homemade whipped cream topping make this fabulous chocolate pie even richer than it looks. If you thought blueberry lemonade was refreshing on a hot summer day, wait until you try it in pie form. The filling takes just a few minutes to mix, then you can pop the entire thing in the freezer and whip it out for your next cookout. This intensely chocolatey pie is filled with a homemade dark cocoa pudding, then topped with homemade whipped cream. Easy as, well, pie. Everyone loves apple pie! This easy vegan version uses a pre-made pie crust and few ingredients, so it's not only simple to prepare, but delicious for everyone no matter their dietary preferences and needs. Just try not to devour this awesome frozen peanut butter cup pie in one go! It makes the perfect dessert or weekend treat for hot days and takes about 15 minutes to prepare. With a creamy vanilla custard filling, this old-fashioned pie truly lets the graham cracker crust shine. Finish it with a fluffy meringue to take it from simple to party-ready. Key lime pie is a beloved dessert that gets its refreshing flavor from fresh or bottled key lime juice. The rich lime custard is baked in a prepared graham cracker crust, then topped with optional meringue. Oh la la! This sweet maple sugar pie is one of Quebec's most famous delicacies. You need just a few ingredients to make a wonderful treat that's a great choice for serving at parties. Citrus lovers will adore this amazing lemon cheesecake pie. Cream cheese and fresh lemon juice and zest come together for a deliciously tangy treat. Kentucky bourbon whiskey gives this ultra-decadent chocolate walnut pie a boozy kick. It's a classic Southern dessert recipe that's sure to become a favorite, no matter where in the world you live. Summer means peaches and there's no better time to whip up this pie than when they're at their peak. A pie shell is filled with fresh sliced fruit and topped with a vanilla-scented peach glaze for even more summer flavor. Kentucky bourbon jazzes up this classic Southern pecan pie, a wonderful holiday dessert that guests will gobble right up. Lemon meringue is undoubtedly one of the world's favorite pies. This winning recipe uses fresh lemon juice and a fluffy meringue topping to make an absolute stunner. Sweet, gooey, and decadent pecan pie is so easy to love, especially when baked in a graham cracker crust. Here's a simple recipe that helps you whip up this downhome treat with ease. This orange meringue pie offers a fun change from lemon meringue and has a sweetly familiar flavor that your family will love. It makes a great pie for the holidays when you want to surprise guests with an unexpected treat. If you love the flavors of chocolate and peanut butter—or you happen to have leftover boxes of Girl Scout Tagalongs cookies—then this no-bake recipe is perfect for you! Cardamon and ground ginger add extra flavor to the homemade pie crust featured in this elegant pear pie. The warming spices help bring out the best of the essential fall fruit and is especially lovely fresh from the oven. This chess pie is a wonderful combination of two iconic tropical ingredients: coconut and pineapple. Bake one up for a summer pool party—or even in the cooler months when you need a tasty distraction from winter storms. Cinnamon adds something special to this fresh plum pie, a lovely dessert to serve at summer dinners, parties, and other gatherings. Cross a pumpkin pie with a pecan pie and you get one delicious hybrid. This pumpkin pecan pie tastes as good as it looks and is the perfect dessert when you can't settle on which to make for Thanksgiving. Rhubarb banana is a refreshing change from the usual strawberry rhubarb combo and your family is sure to love the extra sweetness and texture from the bananas in this fabulous recipe. From the homemade cinnamon-spiced graham cracker crust to the luscious double layer of pumpkin filling, this cheesecake pie will impress everyone who tastes it. You'll be shooing away greedy hands from eating this pie before dinner is over! The classic treat has a rich molasses filling and crumbly brown sugar topping that's simply irresistible. Overflowing in rhubarb from the garden? Turn the stalks into a fabulous rhubarb custard pie that takes no longer than 15 minutes to prepare if you use a store-bought pie crust. Have you tried old-fashioned sugar cream pie? It's an easy, custard-style pie flavored with butter, vanilla, and nutmeg that's sure to become a family favorite. Strawberries and cream are a match made in dessert heaven. They come together beautifully in this wonderful recipe that includes a custard filling and a store-bought pastry shell to help save you time. When you're looking for a fall dessert, this crowd-pleasing recipe should be a top choice. 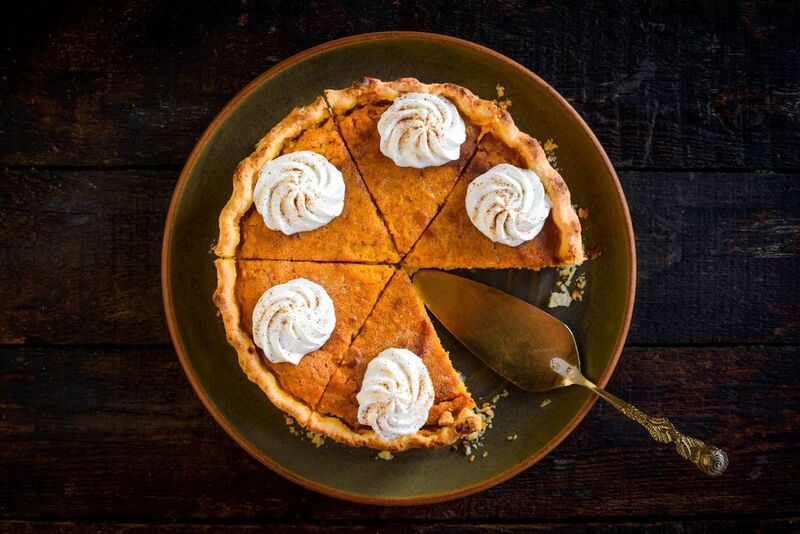 The old-school recipe stays true to Southern tradition with a filling made with butter and mashed sweet potatoes and flavored with vanilla and cinnamon. Chopped watermelon rinds are sweetened and cooked with spices, raisins, and pecans to create the summery sweet filling for this creative double crust pie. Sticky toffee, sweet bananas, and a creamy homemade caramel sauce combine in this luxurious dessert. Serve it when you want to wow some friends. As a good host, your holiday celebrations call for desserts that taste great and suit everyone's needs. This homemade vegan pumpkin pie is a dairy-free alternative that's just as craveworthy as the classic version.